Ethos Books (2012, 2nd ed. )/ 148 pp. Hello and welcome to Isaac Encounters! Today I’ll be encountering Beyond The Village Gate by Mei Ching Tan, published by Ethos Books. When I was on my usual visit to the bookshop, the cover of this book caught my eye and I thought it was a new novel by a local writer. I was surprised to find out that this novel was awarded the commendation award in the 1992 Singapore Literature Prize and was first published in 1994. The copy I have is a recent reprint under the Ethos Evergreen series. Considering that it received some attention when it first came out and a publisher would take the risk of reprinting it as an evergreen title, I decided to give it a shot and was rewarded in a few ways. The story is set in a fictional village in China and revolves around an orphan, Shi Ying (which translates as Lost Child) who was abandoned as a baby, found by a villager, and was given to a family of fisherfolk. Growing up, she has always felt distant from her adoptive family and wonders who her biological parents are. An incident with a village outcast, who was pregnant out of wedlock, led Shi Ying to form a bond with her. This interaction sparked off her journey in search of her identity. The novel excels in dealing with the theme of escape in a nuanced manner while telling the story through the child’s perspective. To give you a sense of the effort and sensitivity that goes into developing this theme, here are a few things that really struck me. Names play a big role in the book. We can easily understand why the protagonist is named 失婴 shī yīng (“Lost Child”). But the name is also a pun on something else that symbolises freedom and escape. As Tan chooses to disclose this intended pun towards the end, you’ll have to read the book to find out. Another pun, which I’m unsure if Tan intended it or not, is 适应 shì yìng (getting used to something). The conflicts between these puns encapsulate the main thrust of the plot beautifully. It is because she’s not used to her situation and feels isolated that she dreams of escape. Names come into play yet again when she asks her friend to give her a new name; a new identity. One of the key features of the story is how myths and legends make up the cultural fabric of society. Shi Ying is very taken with such stories because her own origin is a legend which keeps changing every time it’s retold. Her unknown origin gives her the possibility of rewriting it and determining how her future will unfold. They also capture Shi Ying’s child-like wonderment which gives the novel hints of magical realism. Whenever she’s out in the fields working or running away, the lines between reality and fantasy are often blurred. While we may disregard it as childish hopes and fears, that is the reality of her experience. Tan did well to maintain that and not let the adults correct that or offer the “truth” as such. Tan cleverly uses myths and legends to give Shi Ying complexity as well. It presents her desire for escape not simply as running away or waiting for her parents to take her away. Escape can also be a form of transcendence. Shi Ying often wish that the wind would take her away or she could ride on the back of a wild creature. As with myths and legends, the supernatural and death loom in the background. Death can also be a form of transcendence as Shi Ying would even welcome it if it provided her an avenue of escape. This reveals the extent of her desire to be somewhere else and someone else. One should not paint it with a broad stroke and view it as depression or having suicidal thoughts. I love how Xiao Ling, the outcast of the village who is pregnant out of wedlock, complements Shi Ying. Her tragic situation is a counterpoint to that of Shi Ying as she has to deal with her child while Shi Ying wonders about her biological parents and deals with her adopted ones. The strange bond that both characters form allows Tan to showcase her sensitivity of language as she develops certain metaphors throughout the whole novel to great effect. I shan’t cite any examples now for it’ll give away too much of the plot. Speaking of other characters, I can see why most of them are less developed. This is how Shi Ying views them which explain her loneliness and isolation. The only exception was when she had to take care of her father and she bonded with him when he talked about his love for his wife. It is unfortunate that it was only a chapter long as I often wondered why the couple agreed to adopt her in the first place. Having extra help on the farm is hardly a strong incentive as compared to the large responsibility one has to shoulder to bring up a child. I sometimes wished Tan could leave a couple of hints for the readers without Shi Ying knowing. I would definitely enjoy this novel even more if it were a couple of chapters longer. That said, I’m surprised how Beyond The Village Gate has so little mention and I would have missed it had it not been the chanced encounter at the bookstore. To end this review, I shall read the last paragraph of the first chapter just to give you a taste of all the points I’ve mentioned thus far. This paragraph really sets the stage for the novel and it’s worth noting that this is not even the best passage. This is a comedy of errors surrounding a family that consists of an Indian husband and a Chinese wife. Hilarity ensues when the undertaker is late and the husband’s uncle and the wife’s mother arrive unannounced to help with the funeral arrangement. This play criticises bureaucracy and how inflexible it is. While one may see the influence drawn from Kuo Pao Kun’s The Coffin is Too Big for the Hole, Somasundram certainly has his own voice that makes this play absolutely hilarious. I was literally laughing out loud, as I was reading his play in my room, to the point of squawking. Yes, squawking. Aside from criticising bureaucracy, this play stands out by exploring a diverse range of issues such as interracial marriage, negotiation between the races, and what death means to the living. These themes are well placed in the play and it doesn’t feel like that playwright is anxious to discuss everything that interests him at one go. Finally, as a testament to the skill of his writing, the play does not merely start from being somewhat funny before escalating the humour. Instead, it actually starts on a slightly tense and poignant note before transiting to the funny bits. The transition is not rushed and it feels like a natural progression. This play is certainly refreshing as most plays that comment on social issues are often serious and morose. One hopes that the playwright continues honing his craft and puts his stamp of comedy on the Singapore stage. For Better Or For Worse by Faith Ng was nominated for best script at the Life! Theatre Awards and it’s not difficult to see why. This play depicts the long marriage between Gerald and Swen; warts and all. It is structured with alternating scenes between the couple as they are now and when they were young. Ng’s ability to portray the differences between a young, hopeful love as compared to one with years of emotional baggage shows Ng to be a sensitive and perceptive writer. The choice to play with absences by making all the other characters invisible allows us to hone in on the marriage of Gerald and Swen. If you remove everyone and everything that one must deal with when one is married, what does marriage; this relationship between two people mean? Perhaps the greatest merit of the play is that it does not offer any easy resolution. Yet, the readers are taken on a journey as we experience all the joys, pains, laughter, and sorrows that comes with life. We are made to dwell in a shared humanity. The only bone to pick with this play is that the level of colloquialism in the dialogue seems to be overdone. Given that Gerald has a diploma and Swen studied at a very good school, they are generally better than average in terms of education for their generation. That said, I am open to the fact that it might not sound so jarring when spoken considering that the theatre reviews did not raise this issue. Three gay men in their 30s and one gay teenager, for their own individual reasons, decide to throw themselves off a cliff. Interestingly, all of them chose the same cliff as they each arrive at different times only to find that someone is already there. They bicker, taunt, challenge, and justify why they should commit suicide. In this morbid situation, they form an unlikely bond. What makes this play a good read is the subtlety in exploring issues about homosexuality. Gay stereotypes and tropes are weapons used by the characters to annoy and confront each other which make for great comedy. Yet underneath the comic exterior, the conflicts among the characters disclose personal difficulties they face as gay men in society. The choice for the slow reveal captured my attention as I was eager to find out what drove them to suicide. Choo certainly struck a right balance between entertainment and mystery which makes for an intriguing and thought-provoking piece. While the gay men are not related by blood, the bond that they form is just like one regardless of whether they would like to admit it or not. I had immense pleasure reading #UnicornMoment by Oon Shu An because it brought back happy memories of watching the stage production earlier this year. It reminded me why I liked the play so much. To top it off, I was pleasantly surprised to find that my review of the production was quoted to promote the play! For those who are interested to read the whole review, I’ve placed the link in the description below. #UnicornMoment is sort of a partial auto-biography of Oon, except that it is much more daunting for her. Rather than just recollecting various episodes of her life, she went back and asked the questions she has always carried with her. Based on a series of interviews with family, friends, and teachers, what emerged is an honest and witty script that captures the various facets of life. It is impossible not to identify with at least one of the scenes. It is rare for one to say this but I am impressed by the stage directions of the last movement sequence. When I was watching the show a few months ago, I was wondering what would the stage directions say and guessed it would just say “final movement sequence.” But what was written in the script did capture the essence of what I saw. I don’t see this play being restaged at all because it is inextricably tied to a point in Oon’s life. But it is worth publishing based on the writing and how it captures a deeply personal experience. After revisiting this play, the title of my theatre review still rings true: #UnicornMoment #Heartfelt #Compelling. 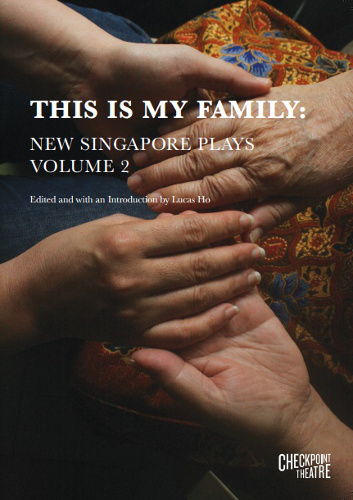 Before reading this play, I thought Family Outing would probably be about everyone being too busy with life and they finally realise the importance of spending time with each other. After reading it, I can’t get over how clever the title actually is as you’ll soon find out. Due to an absurd accident, Joseph is electrocuted while trying to fix the TV. One year later, Joseph’s boyfriend, Daniel—in accordance with Joseph’s wishes—appears at Joseph’s family dinner commemoration to tell them that their son is gay. This does not bode well for them, especially Joseph’s mother who is a staunch Christian. Family Outing thus explores what happens when a son posthumously comes out to his family. Get the cleverness of the title now? One thing that stood out to me is how Joel Tan deals with memory by weaving the past and present into the same scene. While this is nothing new, I like how he uses the same device to show the family reminiscing or re-constructing the past. The revelation of Joseph’s sexuality then forces the family to deal with how to carry on their lives while holding the memory of Joseph dear to their hearts. While it is possible to criticise the ending for being too easy and too neat, I think it captures the wonderful thing about familial bonds. It is this indescribable instinct we have of our family members, and they of us; a sort of inherent knowing. We love and hate this instinct at the same time, that’s what makes being part of a family so intriguing. While the play explores the conflict between religion and sexuality among other issues, Family Outing is more about love than anything else. As the title suggests, Recalling Mother is a play in which Claire Wong and Noorlinah Mohamed play as themselves and they recall what their mothers are like at various stages of their lives. Parallels and contrasts are at the heart of this play. We are made aware of the different backgrounds and cultures of both women, yet certain struggles or concerns are very similar in any parent-child relationship. One element that fleshes out these parallels and contrasts is language. From the get-go Cantonese and Malay are used whenever they converse with their mothers. In certain situations, the mother tongue represents a generational and language gap. In others, it is comforting as it allows both ladies to access their childhood memories. It is, at the same time, a tool of isolation and reconciliation. This review would be incomplete without discussing the words in the script itself. The simple conversational style makes it very accessible. In fact, the shortest sentences tug at one’s heart strings the hardest. It is no wonder The Straits Times review of the stage production states that the play will “make you go home and hug your mother much harder.” I couldn’t agree more. If I were to sum up my experience of reading this anthology in a sentence, it is this: reading these plays makes me regret not catching these productions when they were staged. So if you are free and have some cash to spare, go catch a local play. You never know, you might be the first to encounter a gem. Hello readers! I am proud to announce that I have launched a new YouTube channel which focuses on book reviews. The following is an introductory video explaining why I made that decision. If you like what I’m doing please subscribe, share my videos, and leave comments!